[The following is a Vyasa- Puja offering of five prayers glorifying special characteristics of Srila 108 Bhaktisiddanta Saraswati Goswami Thakura. 3. Sri Caitanya Mahaprabhu's judgement is that renunciation is most important. Not only that, but such knowledge must be delivered to every conditioned being. 5. One bewildered by ignorance, what kind of renunciate can he be? He will only be a "phalgu-vairagi"; renouncing externally. 7. But there is another "show-bottle" for the purpose of preaching. That is the Lord's sannyasa by which the Mayavadis are defeated. 8. Lord Caitanya's Philosophy is beyond varnasrama; it is Bhagavata dharma, for putting an end to all cheating processes of religion. 9. Performing dry renunciation there can be no real preaching. Therefore "Yukta vairagya" is given the highest essential understanding. 10. "That sannyasa which I have given you" is for preaching in devotion. The faithless sense enjoyers are unable to understand this. 26. The service of the message is the real meaning of the Vedas. Don't be proud, brothers, come back to this. 28. That Kali's mission was to kill the entire world while the essential meaning of Lord Caitanya's message was kept locked up in a cage. 29. O shame! My dear brothers, aren't you embarrassed? In the manner of businessmen you increase your disciples. 31. All these things are not our spiritual master's preaching methods. These are all the things done by the caste Gosvamis. 33. In the temples they have also begun to lock the doors. Preach this bhagavata dharma, don't hesitate. 35. The preaching that "mullah (Muslim priest) only goes as far as the mosque and no further" should be put to an end today. 37. Then our master's service will be in proper order. Make your promise today. Give up all your politics and diplomacy. 40. The one who renounces the guru's order (guru tyagi) and the one who tries to enjoy the assets of his spiritual master (guru-bhogi) are two kinds of useless persons. First become a servant of your spiritual master (guru-sevi) and then you will understand things clearly. 44. The Supreme Lord says that everything is Mine. Don't protest. Just unite and preach. 50. When the big court judge will be a Gaudiya Vaisnava with tilak beautifully decorating his forehead. 51. A Vaisnava winning votes will be elected president of the land and preaching will spread everywhere. 52. The demons simply plunder the Lord's wealth. The hapless populace cry, "Hai Hai" in distress. 53. The demons want so many plans just to cheat the people. They sell wheat flour at 32 rupees a mound. 54. Will opening a factory fill a hungry man's belly? Being oppressed by starvation they will eat grass and mango pits. 55. Wearing a two pisa string a man is called a brahmin. Wearing a saffron cloth he has become a sannyasi. 56. The householders beg from sannyasis, and why not? The sannyasis have tens of millions of rupees in the bank. 57. As the days pass, the influence of Kali-yuga increases and the poor are crying in distress. 59. People of muddy intelligence increase day by day. A man and his wife separate on mere word. 61. The Vaisnavas are famous as "para dukha dukhi." This fame will increase as the preaching increases. 62. If eternally pure devotional service to Krsna is awakened in everyone, then Kali will flee, screaming of his own accord. 63. "Praninan upakaraya" do work for the benefit of all living beings. This is Mahaprabhu's teachings. This is the storehouse of happiness in this life and the next. 67. He was the best of the Vaisnavas, para dukha dukhi. He knows that there is not real happiness in gratifying the senses. 68. And what kind of mercy can the non-Vaisnavas give? They simply make offenses by their Daridra Narayana philosophy. 69. The mercy of the Vaisnavas is scientific and authorized, without their mercy this world is simply insurmountable maya. 70. If there is a kingdom of Visnu and Vaisnavas on the surface of the earth, then the world will be happy--so say the great sages and rishis. 71. Why is everyone crying for Rama-rajya? The only way it can be had is if there is a Visnu centered kingdom. 72. Lord Krsna enthroned King Yudhisthira; then the whole world was rich and fortunate due to the qualities of a Vaisnava. 73. The streams, rivers, trees and fields and mountains, were all full of fruits and flowers. The milk laden cows were floating in abundant milk. 74. The birds, beasts and lower creatures were all non-envious. Material life in the Vaisnava kingdom was regulated and perfect. 75. All immersed in bliss, singing the glories of the Hari. The hearts of Vaisnavas dance in ecstasy to see this. 77. Still they are searching after peace. Preach Krsna consciousness; fulfill their desires. 79. 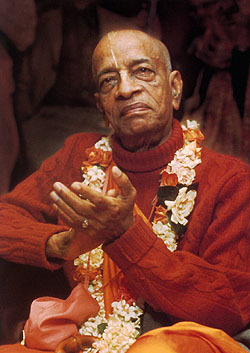 Srila Prabhupada, please be merciful today. This time have compassion. You are not a conditioned soul of this material world.